If you are a U.S. Citizen and are married to an immigrant you have 2 ways to obtain a green card for her. If she is in the United States then you would go through a process called adjustment of status. That is what this article is about. If she is outside the United States then you would go through a different procedure that is not covered in this article. Either way you should consult with a qualified immigration attorney prior to filing any paperwork with USCIS as you can have serious long-term problems if paperwork is not completed correctly or your case is improperly filed. To obtain a green card through marriage you must make sure that you are legally able to get married. If you got married out of the United States you must make sure you followed their laws concerning marriage. If you were married before you must make sure that it was terminated. It can be terminated only through death, divorce or annulment. This area can be tricky as some people think that they are free to marry (they believe that their divorce was done correctly when it was not) when they are not. You cannot file for a green card for your spouse if either of you is still technically married. Because you are a U.S. Citizen your spouse will be able to get a green card in the United States quickly. The process should take only 3-7 months. Most of our cases process from start to finish within 4 months. The burden will be on you to prove to USCIS that your marriage is legitimate. You will need to file documents with USCIS. Both of you will file G-325a forms. In addition, the U.S. Citizen spouse will file form I-130 and proof of citizenship (either a certified copy of his birth certificate, U.S. passport, or copy of naturalization certificate) and a certified copy of divorce, death, or annulment decrees or certificates (if applicable). He will also need to take and submit passport photos (currently USCIS wants color passport photos and from the front not side angle). In addition USCIS will require that the U.S. Citizen prove that he can financially support his spouse. The U.S. government does not want the immigrant to file for welfare or other pubic benefits. The U.S. Citizen will need to provide 3 years worth of federal tax returns, a letter from his employer showing that he is currently employed and his current income, and bank statements. If the U.S. Citizen is not currently working the requirement can be met in other ways. Sometimes U.S. Citizens are not currently working but they have assets that USCIS will accept as proof that the immigrant will not receive public benefits. If there are not sufficient assets to meet the requirement you can also obtain a co-sponsor. Because a co-sponsor will be financially responsible for the immigrant usually only close relatives or very close friends tend to be co-sponsors. The co-sponsor will need to complete an additional I-864 form, turn in bank statements and tax returns to the government. 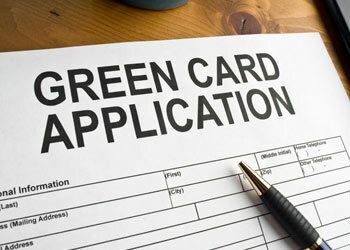 The co-sponsor will need to be a green card holder or U.S. Citizen to qualify. In addition, they will need to turn in their federal tax returns, bank statements and a letter from their employer just like the U.S. Citizen. If the immigrant did not enter legally they might be still eligible to file for their green card. However, this is a complicated area of the law. If the immigrant entered illegally then he or she should definitely consult with an immigration attorney prior to proceeding with the case. Failure to do so could lead to removal from the United States for 3 to 10 years. Medical Exam by USCIS approved Doctor. A few weeks after you have filed your case you will receive a receipt notice. This will let you know that the packet was received by USCIS. A few weeks later you will receive your a biometrics appointment notice in the mail. Biometrics is done in order for USCIS to do a security check on the immigrant..
You will then receive an interview notice for your interview. This interview should occur approximately four months after the original documents were filed with USCIS. You may wish to read our blog article titled: Sample questions for green card interview. About 3 months after you filed your original documents with USCIS you should receive your employment authorization card from USCIS. They will mail this card to you. If all goes well at the interview then the immigrant should receive her green card in the mail within 30 days. However there could be a delay due to an issue with the security clearance or other delays. Usually this is not a problem. Do not leave the United States until you receive your green card. If you feel you must leave the country prior to your green card being issued then you may apply for advance parole in order to leave. However, do not apply for advance parole if you have been in the United States illegally for 180 days or more as you may not be able to return for 3-10 years. (You should speak to an immigration attorney prior to leaving the United States.) Also, as an added wrinkle, just because USCIS grants you advance parole does not mean that they will actually allow you to re-enter the United States. You need to be very careful in this area.